Australian Internet of Things technology company, Xped Limited (ASX:XPE) is pleased to announce the execution of a binding technology development agreement with Heuresy Labs LLC. Under the agreement, Xped will develop a new cryptographic Physical Security Token which is a hardware security device that provides authentication and encryption. 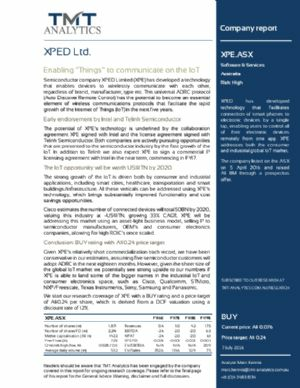 Australian Internet of Things technology company, Xped Limited (ASX:XPE) is pleased to provide this market update regarding recent progress and developments. Xped Limited (ASX:XPE) is pleased to announce the appointment of Mr John Schultz as an executive director, effective from 30 March 2018. Xped Limited (ASX:XPE) is pleased to announce the appointment of Mr John Santich as a joint Company Secretary of the Company, effectively immediately. Australian Internet of Things technology company, Xped Limited (ASX:XPE) today announced it entered into a binding term sheet agreement on the 29th of October with Heuresy LLC. The term sheet is subject to two conditions precedent both of which were satisfied on the 14th of December. Australian Internet of Things technology company, Xped Limited (ASX:XPE), today announced it had made an investment in Marketplace Services Pty Ltd.
Xped Limited (ASX:XPE), an Internet of Things technology company, is pleased to announce the receipt of a Research and Development Tax Refund from the Australian Tax Office of $2,335,259.66 for the financial year ending 30 June 2017. Xped Limited (ASX:XPE) is pleased to announce that its subsidiary JCT Healthcare has been successful in recently winning several tenders with its Smart Home Assisted Living Technology Solution. 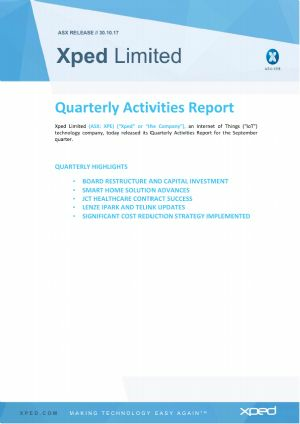 Xped Limited (ASX:XPE), an Internet of Things technology company, today released its Quarterly Activities Report for the September quarter. XPED Ltd (ASX:XPE) provides Chairman&apos;s and Managing Director&apos;s letter to Shareholders. The principal activity of XPED Ltd (ASX:XPE) is a technology company specialising in Internet of Things (IoT). Xped is developing IoT solutions for 3 primary target markets. 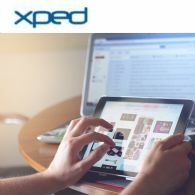 Emerging Australian Internet of Things technology company, Xped Limited (ASX:XPE), today announced an organisational re-structure, targeting significantly reduced expenditure and increased efficiency of the Company&apos;s Board and Management. Xped Limited (ASX:XPE) is pleased to provide this market update. Xped Limited (ASX:XPE) is pleased to announce the appointment of Mr Peter Hunt as Non-Executive Chairman of the Company. Mr Hunt is a Chartered Accountant and Consultant to BDO Adelaide. He was a former partner of PKF Adelaide, Chartered Accountants, which merged with BDO Adelaide in 2012. He has broad experience as an independent director and chairman of ASX listed and private companies. Xped Limited (ASX:XPE) is pleased to announce we will be attending CEDIA 2017 to be held in San Diego, USA, in September. Xped Limited (ASX:XPE) ("Xped" or "the Company") is pleased to announce they have signed an agreement with Eastool Solution ("Eastool") of Malaysia. Xped Limited (ASX:XPE) wish to advise that the Company has completed a placement for 250,000,000 fully paid ordinary shares at an issue price of 1.2c per share to raise $3,000,000 (Placement Shares), utilising shareholder approval which was obtained on the 30th of May 2017, to issue future placement shares. Xped Limited (ASX:XPE) wish to advise that the Company has redeemed the outstanding convertible securities from the Tranche 1A, and repaid all of the amount outstanding in respect of them. Xped Limited (ASX:XPE) is currently undertaking a Private Placement to sophisticated investors. Xped Limited (ASX:XPE) is pleased to release the attached presentation being used for investor meetings. XPED Ltd (ASX:XPE) is pleased to announce that their subsidiary JCT Healthcare has been successful in winning a $649,000 tender with Renewal SA. XPED Ltd (ASX:XPE) provides the Company&apos;s CEO letter to Shareholders. Xped Limited (ASX:XPE), the Internet of Things Technology Company has today released its Quarterly Activities Report for the quarter. Xped Limited (ASX:XPE) is pleased to provide this market update regarding recent progress and developments. Xped Limited (ASX:XPE) is pleased to confirm that acceptances of applications pursuant to Bonus Option Offer announced on 18 May 2017 have been received from Eligible Shareholders for a total of 149,285,289 Bonus Options. The valid acceptances give rise to a shortfall of 419,391,619 new Options. The Bonus Option Offer closed on Tuesday, 11 July 2017. XPED Ltd (ASX:XPE) announces that the Share Sale Facility (the Facility) of ordinary shares for shareholders who hold less than a "marketable parcel" closed at 5pm (AEST) on 23 June 2017. XPED Ltd (ASX:XPE) provides the following update in respect of Media Intelligence Co. Pty Ltd.
XPED Ltd (ASX:XPE) is pleased to confirm that it has today lodged a prospectus for the non-renounceable pro rata offer to shareholders of one Bonus Option for every two shares held in the Company, initially announced on 18 May 2017. The Bonus Options have an issue price of $0.001 each and will be exercisable at $0.04 each within six months of issue (18 January 2018). XPED Ltd (ASX:XPE) is pleased to announce updated details of the non-renounceable pro rata offer to shareholders of one Bonus Option for every two shares held in the Company, initially announced on 18 May 2017. XPED Ltd (ASX:XPE) is pleased to announce they have signed a Memorandum of Understanding with Compal Electronics Inc (TPE:2324) of Taiwan. The companies will now collaboratively engage to develop a binding agreement to license several Xped technologies, and collaboratively market to Compal customer base. XPED Ltd (ASX:XPE) is delighted to provide a "market update" regarding recent progress and developments within the organisation relevant to all operational divisions and business development activities. XPED Ltd (ASX:XPE) is pleased to provide this update to the market. 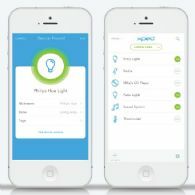 The market was informed on the 19th May that the Company had delivered a production version of the Android and iOS iPark APP to Shenzhen Lenze Technology Co Ltd.
XPED Ltd (ASX:XPE) advises that the Company has now executed the transaction and completed the purchase of Jemsoft. XPED Ltd (ASX:XPE) is pleased to announce that it has successfully developed and delivered the production Android and iOS iPark App to Shenzhen Lenze Technology Co. LTD.
XPED Ltd (ASX:XPE) is pleased to announce a pro rata offer to shareholders of one Bonus Option for every two shares held in the Company. XPED Ltd (ASX:XPE) is pleased to announce they have entered into an agreement to acquire the Jemsoft Group of companies. XPED Ltd (ASX:XPE) is pleased to announce that it has successfully completed a scoping workshop in Shenzhen with Lenze to deliver the new generation Bluetooth based iCharger project demonstrating a significant reduction in development time for Lenze. XPED Ltd (ASX:XPE) is pleased to announce that it has completed the Auto Discovery Remote Control port to the Telink 8269 chip (TLSR8269F512). Xped Limited (ASX:XPE) is pleased to announce they have signed a Memorandum of Understanding with a Taiwanese company Dexatek Technology Ltd. The companies will now work to develop a binding agreement to license Xped technologies, potentially develop specific solutions for Dexatek customers, and collaboratively market products. XPED Ltd (ASX:XPE) is pleased to provide the latest Company Update. The directors present their report on the consolidated entity consisting of Xped Limited (the "company" or "Xped") (ASX:XPE) and the entities it controlled at the end of, or during, the half-year ended 31 December 2016. XPED Ltd (ASX:XPE) is pleased to announce they have signed a Memorandum of Understanding with Advanced Semiconductor Engineering Inc (NYSE:ASX) (TPE:2311) of Taiwan. XPED Ltd (ASX:XPE) is pleased to announce they have signed a licensing agreement with Solekai Systems. This follows on from the Memorandum of Understanding announced on February 6th, 2017. XPED Ltd (ASX:XPE) is pleased to provide an update on the ADRC port to the Telink 8269 chip. XPED Ltd (ASX:XPE) is pleased to announce they have signed a Memorandum of Understanding with Solekai Systems that will result in both companies working together and develop a binding agreement to license several Xped technologies and collaboratively market and develop solutions for Solekai customer base. 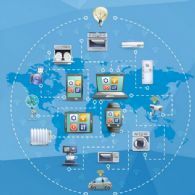 Xped Limited (ASX:XPE), the Internet of Things ("IoT") Technology Company has today released its Quarterly Appendix 4C filing for the quarter. XPED Ltd (ASX:XPE) is pleased to release the presentation being used for business development and investor meetings. XPED Ltd (ASX:XPE) is pleased to announce it has signed its first licensing agreement with Shenzhen Lenze Technology Co. LTD and their subsidiary Complex Semiconductor (HK) Co. LTD.
XPED Ltd (ASX:XPE) is pleased to announce the completion of the Conditional Sale and Purchase Agreement with Singapore based KS Orka Renewables Pte Ltd.
Xped Limited (ASX:XPE) is pleased to announce they have signed a Memorandum of Understanding with Arcadyan Technology Corporation (TPE:3596) that will result in both companies working together and develop a binding agreement to license several Xped technologies and develop complete end to end IoT solutions for Arcadyan and for the Arcadyan OEM Customer base. 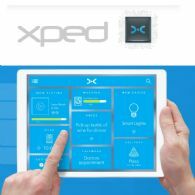 Xped Limited (ASX:XPE) ("Xped" or "the Company") has successfully ported its patented Auto Discovery Remote Control ("ADRC") on Intel&apos;s (NASDAQ:INTC) Smart Home Gateway. XPED Ltd (ASX:XPE) is pleased to announce that its wholly owned subsidiary JCT will be expanding supply of their innovative healthcare equipment and services into the aged care industry. This will be achieved through a national sales team of quality channel partners. JCT has recently signed 5 new channel partner agreements. Xped Limited (ASX:XPE) is pleased to release the attached Xped Customer presentation for business development and key meetings in Asia and North America. Xped Limited (ASX:XPE) announces it has successfully ported ADRC to the STM32 Ultra Low Power microcontroller series. Xped ported its ADRC firmware onto STM32 Microcontrollers using the STM32Cube development ecosystem. 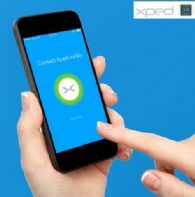 Xped Limited (ASX:XPE) is pleased to provide an update in relation to the development of new functionality for the Xped app that provides control over Complex Semiconductor&apos;s iCharger device. Xped Limited (ASX:XPE) is pleased to provide an update in regards to the first delivery of Auto Discovery Remote Control ("ADRC") and "DiscoverBus" enabled products. XPED Ltd (ASX:XPE) is pleased to provide the company&apos;s AGM Presentation. 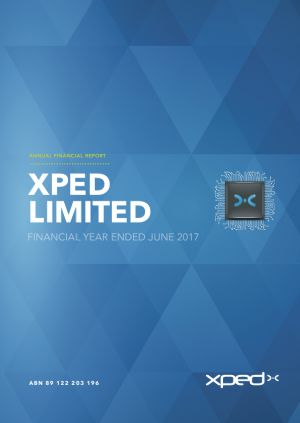 XPED Ltd (ASX:XPE) is pleased to present its Annual Report for the financial year ended 30 June 2016. XPED Ltd (ASX:XPE) is pleased to provide the responses from MD Mr Martin Despain to questions raised recently by investors. XPED Ltd (ASX:XPE) wishes to announce it has successfully ported ADRC technologies to chipsets from both US Listed chipset manufacturers previously announced in separate Memorandums of Understanding signed this year and is close to finishing a port to the Telink 8269 SOC which is expected to be completed by the end of 2016. The Xped App has been approved by Apple and is now available in the App store. The Xped App is now available in both the Google Play(TM) Store for Android devices and the Apple App store for iOS devices. 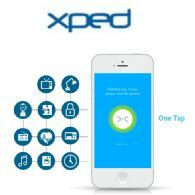 The Xped App is an essential component of the Auto Discovery Remote Control (ADRC) technology solution providing the user interface. XPED Ltd (ASX:XPE) is pleased to announce a $10m premium to market convertible 3 year, 8.35% percent note along with a Share Purchase Plan of up to $7.5m priced at 3.3c per shares with a 1:1 attaching option exercisable at 5c and expiring in December 2018. The company expects to have this option listed post regulatory and shareholder approval. XPED Ltd (ASX:XPE) is pleased to release the company&apos;s Investor Roadshow Presentation ahead of a planned North American roadshow this week. XPED Ltd (ASX:XPE) has today released its Quarterly Activities and Cashflow Report. Xped Limited (ASX:XPE) is delighted to announce it has executed a Term Sheet with the shareholders of Codium Pty Ltd to acquire 70% of the issued capital ("Majority Shares") in Codium, with an option to acquire the remaining 30% ("Proposed Transaction"). Xped Limited (ASX:XPE) is pleased to announce it has been accepted as a Platinum Member of the Open Connectivity Foundation ("OCF"). Xped recently joined the OCF community and following endorsement as a Platinum member will continue to raise its awareness amongst the members of the community. Xped Limited (ASX:XPE) ("Xped" or "the Company") is pleased to announce the launch of its new corporate website. The new website provides an improved platform and user experience for visitors to navigate and keep up to date on Company developments. XPED Ltd (ASX:XPE) directors present their report on the consolidated entity (referred to hereafter as the "Group" or "Xped") consisting of Xped Limited and its controlled entities for the financial year ended 30 June 2016. Xped Limited (ASX:XPE) wishes to advise that its team has returned from a Microsoft Partner conference held in Singapore. Xped Limited (ASX:XPE) wishes to advise that its new Device Browser App has been released to the Google Play(TM) Store for Android devices. 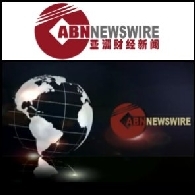 The App has been released in English with a Chinese language translation underway given these two languages represent the main core targets for the Company at the present time. Xped Limited (ASX:XPE) wishes to advise that it has executed a Joint Venture agreement with Complex Semiconductor Co Ltd to jointly develop a sales and manufacturing channel to allow ADRC growth through Xped app subscriber acquisition, device data capture, analytics and product distribution in China and abroad. Xped Limited (ASX:XPE) wishes to advise that its Wireless Device Detection and Communication Apparatus and System (PING) patent has now been granted in Australia and its Arrangement for Managing Wireless Communication Between Devices (ADRC) patent has been granted in Korea. Xped Limited (ASX:XPE) wishes to provide an update regarding Board and Management changes. Xped Limited (ASX:XPE) is pleased to announce that it has secured Mr Martin Despain as Managing Director of the company, effective from 19 September 2016, post vacating his tenure at Intel. Xped Limited (ASX:XPE) wishes to provide an update on its subsidiary company JCT Healthcare Pty Ltd ("JCT" or "the Company"). Xped Limited (ASX:XPE) is pleased to announce it has joined the Open Connectivity Foundation TM ("OCF") as a gold member. Intel(R) who are one of the foundation partners of OCF, recently invited Xped to join after the Company successfully ported its ADRC technology onto Moon Island Gateway platform. Xped Limited (ASX:XPE) ("Xped" or "the Company") wishes to provide a Company Update regarding the progress with Telink, the first release of Xerts, presentation of ADRC at an upcoming Microsoft Partner Conference, as well as an Intel and JCT Healthcare update. Xped Limited (ASX:XPE) wishes to provide Company Update on Sokoria project and Management change. Xped is pleased to announce KS Orka Renewables Pte Ltd ("Orka") has provided an initial USD$700,000 in funding to PT Sokoria Geothermal Indonesia ("SGI"). Xped Limited (ASX:XPE) ("Xped" or "the Company") wishes to announce that it has officially released "Part 1" of its series of ADRC and RML reference guides for the community of developers and industry manufacturers. 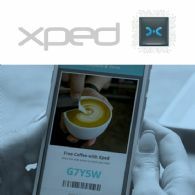 Xped Limited (ASX:XPE) wishes to provide a Company Update, including; launch of app in iOS & Android stores, open opportunities in automotive accessory & smart home lighting markets, large scale roll out of development with automotive accessory company and the review of presented opportunities. Xped Limited (ASX:XPE) ("Xped" or "the Company") wishes to announce it has entered into a binding Conditional Sale and Purchase Agreement ("CSPA") with Singapore based KS Orka Renewables Pte Ltd ("Orka"). 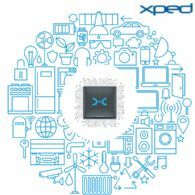 Xped Limited (ASX:XPE) ("Xped" or "the Company"), the Internet of Things ("IoT") Technology Company has today released its Quarterly Appendix 4C filing for the quarter. Xped Limited (ASX:XPE) wishes to advise it has been invited to attend and showcase its product registration system at the upcoming Microsoft Partner Summit in late September. Xped Limited (ASX:XPE) wishes to advise its subsidiary company JCT Healthcare Pty Ltd ("JCT") has begun working on a smart hub technology project for delivery to Disability SA. Xped Limited (ASX:XPE) wishes to advise that TMT Analytics Pty Ltd have begun initiating research coverage of the Company and have released their first coverage report. Xped Limited (ASX:XPE) wishes to announce that Xped Holdings Limited and Telink Semi-conductor Co LTD have entered into a Licensing Agreement, whereby Xped will license its proprietary Auto Discovery Remote Control technology to Telink to develop and supply chipsets incorporating ADRC. Xped Limited (ASX:XPE) wishes to advise that in accordance with the Heads of Agreement between Xped and the shareholder of JCT Healthcare Pty Ltd and Jackson Care Technologies Pty Ltd, the Company has now executed and completed the Sale and Purchase Agreement of JCT. Xped Limited (ASX:XPE) wishes to provide an update regarding Board and Management changes, highlights include: Former Intel Capital Managing Director appointed to the aoard. Appointment of Chairman, CEO and CTO. As well as update on JCT update. Xped Limited (ASX:XPE) ("Xped" or "the Company") is excited to announce it has completed the final step of testing ADRC services against Intel(R) Moon Island gateway platform on the Advantech hardware. Xped Limited (ASX:XPE) is pleased to announce that in accordance with the Heads of Agreement entered into between Xped and the shareholder of JCT Healthcare Pty Ltd and Jackson Care Technologies Pty Ltd (JCT), both Xped and the vendor have formally and satisfactorily completed their Due Diligence in respect of the acquisition of all of the issued capital in JCT (JCT Acquisition or Transaction). Xped Limited (ASX:XPE) ("Xped" or "the Company") wishes to provide an update on the JCT Healthcare acquisition. Xped Limited (ASX:XPE) wishes to provide a market update on recent positive developments. Xped Limited (ASX:XPE) is pleased to announce that it has engaged leading software developer Codium to develop and build the next release of the company Device Browser App. Under the agreement, Codium will provide full native Android and iOS Apps. Xped Limited (ASX:XPE) is now delighted to announce that it has just completed successful porting of its ADRC gateway services using an Advantech Embedded IoT Gateway running Linux. Xped Limited (ASX:XPE) wishes to advise the market that it has continued to expand its Intellectual Property portfolio with further grants and filed applications underway in various jurisdictions. Xped Limited (ASX:XPE) ("Xped" or "the Company") wishes to provide a market update on recent events and upcoming activities. 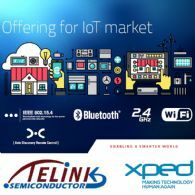 Xped Limited (ASX:XPE) wishes to announce that Xped and Chinese fabless semiconductor company Telink Semiconductor ("Telink"), have commenced collaboration and development on a project to port Xped&apos;s ADRC IoT Stack to Telink&apos;s "TLSR8269F512" IoT chip. XPED Ltd (ASX:XPE) would like to provide a further updated version of the "Telink Xped Marketing Presentation". XPED Ltd (ASX:XPE) are pleased to provide the Company&apos;s latest presentation titled, "Telink and Xped Share Vision on Leading IoT Race." Partnering to provide world leading, highly integrated, low power SOC soon with ADRC technology. Xped Ltd (ASX:XPE) wishes to announce that the Company and Telink Semiconductor (Shanghai) Co, Ltd have entered into a Joint Collaboration and Marketing Agreement that will see the parties work together and market their respective products and technologies. Xped Ltd (ASX:XPE) is in the process of completing its due diligence for the proposed acquisition of JCT Healthcare as per the announcement dated 19 April 2016. The company would like to confirm that the due diligence is progressing well and further updates will be made to the market in due course. Xped Limited (ASX:XPE) wishes to announce that it has executed a binding Term Sheet along with its JV partner PT Bakrie Power to sell down its stake in the project to PT Dalle Geothermal Energy and/or affiliates. Xped Limited (ASX:XPE) today announced the appointment of Dr. Wenjun Sheng as a Non-Executive Director of the company, effective from today 21 April, 2016. Xped Ltd (ASX:XPE) is pleased to announce that it has entered into a Heads of Agreement with the shareholder of JCT Healthcare Pty Ltd and Jackson Care Technologies Pty Ltd to acquire all of the issued capital in JCT (JCT Acquisition or the Transaction). With the ADRC software supporting prototype demonstrations, XPED Ltd (ASX:XPE) is expanding its reach and penetration in the IoT ecosystem; we are engaging prospective industrial customers in commercial and market trials. The company has established a number of Memorandum of Understanding (MOU&apos;s). Xped Limited (ASX:XPE) is delighted to announce that Xped&apos;s ADRC technology will soon be compatible and available on the "Intel(R) IoT Gateway". Intel customers will have access to all the benefits that ADRC technology provides, including NFC on-boarding of devices with a simple tap. Xped Ltd (ASX:XPE) ("Xped" or "the Company") wishes to announce that Xped Holdings Limited has received an official "notice of patent grant right" for the flagship ADRC patent from the China Patent Office on March 29th 2016. Xped Limited (ASX:XPE) wishes to announce that is has acquired a 35% interest in Vital Xense Pte Ltd a Singapore based company with a focus on designing and distributing sensor and related equipment to customers in its region. 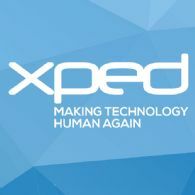 Xped Limited (ASX:XPE) wishes to announce that Xped Holdings Limited and a leading US listed technology company have entered into a Memorandum of Understanding (MOU) to identify and develop potential business transactions utilizing XPED&apos;s patented Auto Discovery Remote Control (ADRC) Technology. Raya Group Ltd (ASX:RYG) is pleased to advise that the Company has issued the balance $5,300,000 worth of the public offer shares. This included the $500,000 priority offer to existing shareholders, which was heavily oversubscribed requiring significant scale backs of allocations. Raya Group Ltd (ASX:RYG) advise the appointment of Mr John Schultz and Christopher Wood as directors on completion of the Xped acquisition on the 23 March 2016 and the resignation of Brendan de Kauwe immediately after completion. Raya Group Ltd (ASX:RYG) is pleased to advise that today it has completed the acquisition of Xped Holdings Limited pursuant to the heads of agreement announced to the market on 26 October 2015. Raya Group Ltd (ASX:RYG) is an Australian-based exploration and development company that is focussed on its portfolio of advanced geothermal development opportunities in Indonesia. Raya Group Ltd (ASX:RYG) wishes to announce that Xped Holdings Limited will be exhibiting at the IoT Asia 2016 event held in Singapore on 30-31 March 2016. Raya Group Ltd (ASX:RYG) wishes to announce that Xped Holdings Limited and LEAPIN Digital Keys LLC have entered into a License Agreement for Xped to supply its proprietary technology for use together with Leapin Digital Keys smart building technology. Raya Group Ltd (ASX:RYG) wishes to announce that Xped Holdings Limited ("Xped") extends its Auto Discovery Remote Control ("ADRC") technology across wired networks to cater for Industrial Internet of Things ("IoT") devices. Raya Group Ltd (ASX:RYG) wishes to announce that Xped Holdings Limited (Xped) and Singapore based sensor company "Vital Xense" expect to begin trials of new "Xped" plug and play hybrid wired/wireless industrial control technology in March 2016. Raya Group Ltd (ASX:RYG) is pleased to announce that the Prospectus Offer, dated 18 January 2016, has been closed heavily oversubscribed following strong support from overseas funds and institutions and existing priority holders. Raya Group Ltd (ASX:RYG) wishes to announce that Xped Holdings Limited and a leading NASDAQ listed chipset manufacturer have entered into a non-binding Memorandum of Understanding to identify potential projects that will utilise and support the "revolutionary" and "patented" ADRC IoT platform technology developed by Xped. The Independent Expert&apos;s Report accompanies the documents dispatched and can be found following this notice along with a copy of the Technical Expert Review. Raya Group Ltd (ASX:RYG) announce the Quarterly Activities Report for the period ending December 2015. Raya Group Ltd (ASX:RYG) wishes to advise the lodgement of a supplementary prospectus with the Australian Securities and Investments Commission today in relation to its general public offer to raise up to $8 million before costs. Raya Group Ltd (ASX:RYG) announces a general public offer for applicants to apply for one new fully paid ordinary share (New Shares) at an issue price of $0.025 per New Share to raise up to $8 million before costs. Raya Group Limited (ASX:RYG) (the "Company"), is pleased to announce the appointment of EAS Advisors, LLC ("EAS") as North American corporate advisors to the Company. Raya Group Ltd (ASX:RYG) is pleased to announce that Dr Daniel Floreani of Flocom Consulting has provided an independent Technical Expert Review on the technology developed by Xped Holdings Limited (Xped). Raya Group Ltd (ASX:RYG) is pleased to announce that Xped Holdings Limited (Xped) and the University of South Australia (UniSA) are working together to build an energy monitoring system that will encompass the "revolutionary" and "patented" ADRC (Auto Discovery Remote Control) IOT technology developed by Xped. In recognition of the support from the shareholders of the Company, Raya (ASX:RYG) wishes to advise that it intends to undertake a bonus issue of options ("Bonus Options") to all eligible shareholders, with the record date to coincide with the shareholder meeting to approve the Xped transaction, anticipated to be mid to late February 2016. Raya Group Limited (ASX:RYG) (Raya) is pleased to announce it has appointed leading Sydney based investment bank KTM Capital Pty Ltd (KTM) as lead manager to raise up to $6.8m for the proposed Prospectus Offering (Offering). 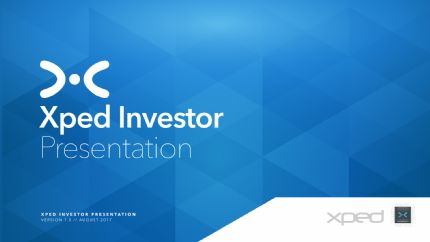 Raya Group Limited (ASX:RYG) (Raya) is pleased to release the attached Xped Investor Presentation, which has been updated and is in the form for the investor roadshow beginning this week. Raya Group Ltd (ASX:RYG) is pleased to announce that Xped Holdings Limited has been awarded a key patent in China for its technology that can create and transfer eCoupons using its unique "tap-to-connect" Internet-of-Things (IoT) solution. Raya Group Limited (ASX:RYG) is delighted to advise that Raya and the Xped Vendors have formally and satisfactorily completed their Due Diligence, and Raya will now proceed forward in acquiring 100% of the shares in Xped. 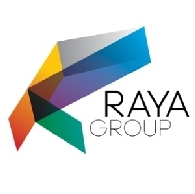 Raya Group Ltd (ASX:RYG) wishes to advise it has finalised its R and D Tax rebate for the year ended 30 June 2015. Raya Group Ltd (ASX:RYG) announced that its unique and valuable patent portfolio of Xped Holdings Limited, continues to grow with yet another patent granted, this time in Singapore, for its flagship Auto-Discovery Remote Control (ADRC) platform. Raya Group Ltd (ASX:RYG) is pleased to announce that its unique and valuable patent portfolio of Xped Holdings Limited (Xped) continues to grow with yet another patent granted, this time in Singapore, for its flagship Auto-Discovery Remote Control (ADRC) platform. Raya Group Ltd (ASX:RYG) is pleased to announce that Company has completed a further private placement to a select group of institutional funds and sophisticated investors raising a total of $1,400,000 to progress the proposed acquisition of Xped Holdings Ltd (Xped). Raya Group Limited (ASX:RYG) wishes to advise that an article written by John Stefanac, CEO of Xped Holdings Limited has today been published by Business Spectator. Raya Group Ltd (ASX:RYG) wishes to announce that Xped Holdings Limited and one of the world&apos;s leading semiconductor chip manufacturers are collaborating to identify potential opportunities that will accelerate market adoption of the "revolutionary" and "patented" ADRC IoT technology developed by Xped. Further to the ASX release of 23 October 2015 in relation to the proposed acquisition by Raya Group Ltd (ASX:RYG) of Xped Holdings Ltd, Raya is pleased to announce that it has completed a private placement to an Asia based strategic technology investor raising $600,000. Raya Group Ltd (ASX:RYG) is pleased to announce that it has received executed agreements from all minority shareholders of Xped Holdings Ltd (Xped). The agreements provide Raya with the right to acquire the remaining 4.4% of the issued capital in Xped. Raya Group Limited (ASX:RYG) ("Raya" or "the Company") wishes to advise a featured article on Xped Holdings Limited ("Xped") was published today in the Technology section of the Australian Financial Review ("AFR"). Raya Group Limited (ASX:RYG) ("Raya" or "the Company") wishes to share the following video presentation provided by Xped Holdings Limited ("Xped"). As announced on 26th October Raya Group Ltd (ASX:RYG) entered into a binding Heads of Agreement (HOA) with the key shareholders of Xped Holdings Ltd (Xped) to acquire all of the issued capital in Xped. Under the HOA, the remaining shareholders who hold 4.4% of Xped are expected to sign documentation by 3 November 2015, which will provide RYG with a right to then acquire 100%. 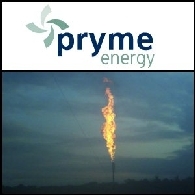 Oil production net to Pryme Energy Limited (ASX:PYM) for the June quarter of 2015 exceeded March quarter production by approximately 139%, similarly natural gas production was up 633% over the previous quarter. 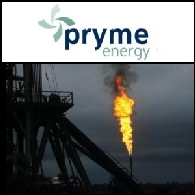 Pryme Energy Limited (ASX:PYM) (OTCMKTS:POGLY) is pleased to announce that it has purchased 2,230 net acres in an oil rich region of the Mississippian Lime in Oklahoma. In conjunction with the acquisition Pryme will enter a 50/50 joint venture with Empire Energy Limited (ASX:EEG) with the objective of growing and developing its footprint within the Mississippian Lime (Newkirk JV). As announced on 23 January, Raya Group Ltd (ASX:RYG) and Bakrie Power have entered into a Heads of Agreement with Space Con Pty Ltd for the sale and purchase of the Sokoria Geothermal Project. Raya Group Ltd (ASX:RYG) and its JV partner Bakrie Power are pleased to announce that they have entered into a Heads of Agreement with Space Con Pty Ltd for the sale and purchase of the Sokoria Geothermal Project. Mr Lanskey holds a post graduate Business Degree from Griffith University. He has over 10 years&apos; experience in the energy industry and from 2006 until January 2014 was a Founder and Managing Director of Austex Oil Limited (ASX:AOK) (OTCMKTS:ATXDY), which is now a successful US operating oil and gas production company. The Board of Raya Group Ltd (ASX:RYG) would like to announce that it has completed a private placement to sophisticated investors raising $200,000 at an above market unit price of 1c per ordinary share. Raya Group Limited (ASX:RYG) is pleased to advise that its US based subsidiary has executed a Letter of Intent (LOI) with the USA subsidiary of Empire Energy Group Limited (ASX:EEG) to jointly identify, acquire and develop oil and gas leases in an exclusive Area of Mutual Interest (AMI) in Northern Oklahoma. Raya Group Ltd (ASX:RYG) is pleased to announce that acquisition of oil and gas leases within an identified Area of Interest (AOI), in Oklahoma, USA, is underway. RYG through its US subsidiaries has currently entered into agreements over approximately 3,200 gross acres under commercially favourable terms and is targeting 6,400 acres (10 square miles) within the AOI. The Board of Raya Group Ltd (ASX:RYG) would like to announce that it has completed Tranche 2 placement raising $500,000, at a unit price of 1.5c per share with ASC Resources (ASC), as a cornerstone investor and a significant shareholder. Raya Group Ltd (ASX:RYG) holds some of the most prospective geothermal sites available in Australia and Indonesia. Whilst the Geothermal sector has been extremely challenging, Raya has been active with Indonesian joint venture partner Bakrie Power. The Board of Raya Group Ltd (ASX:RYG) would like to announce that it has received confirmation from the Indonesian Minister of Energy and Mineral Resources granting approval to sell electricity to PT PLN (Persero). Raya Group Ltd (ASX:RYG) advises that the resolutions put to its Extraordinary General Meeting, held on 7 October 2014 were passed. The Board of Raya (ASX:RYG) would like to announce that together with its Joint Venture Partner "PT Bakrie Power", a final "Power Purchase Agreement" has been agreed between PT PLN and PT Sokoria Geothermal Indonesia.